There are times when the police reaction to protests is so clearly disproportionate that even they seem shocked by it – or perhaps by the public reaction to it. Despite the occasional efforts of the ‘black bloc’ at protests here we don’t have a great tradition – at least not recently – of violence by protesters at protests. Almost all of the incidents in recent years, for example during the student protests in 2011, were either provoked by police attacks on protesters or probably engineered by the police actions, aided by undercover police. 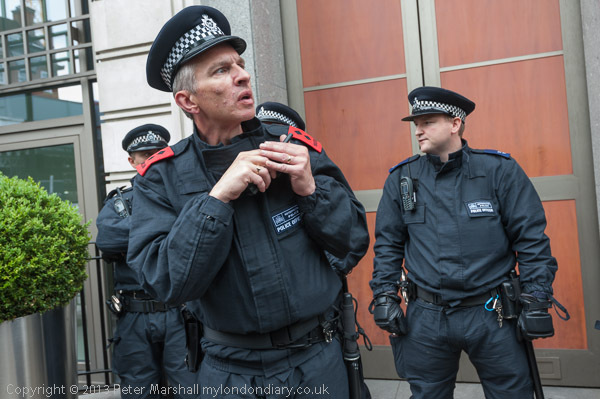 Several times in the past few years senior officers of the Met have given interviews to the press in advance of protests spreading rumours of violence and mayhem, drumming up panic which they then use to justify draconian police measures. Ahead of one protest they spread rumours that protesters would use catapults, and on the day thoughtfully provided these dropped in the area in a black bin bag. 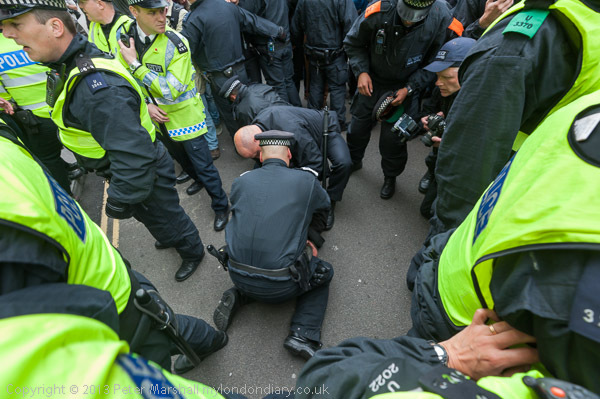 The police rationale for the huge exercise against a squat in Beak St, Soho on the morning of the first day of four of activities ahead of the G8 seemed particularly lame, even to the tamer of the media outlets. 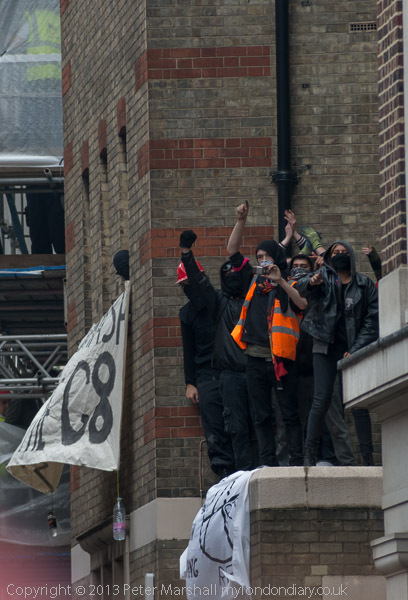 That there were rumours that some activists might be intending to use paint or paintballs seemed hardly a justification for closing down a large area of London with hundreds of police, and for the violent storming of the social centre that was acting as the ‘convergence centre’ for the protests. Not that I approve of protesters throwing paint – and particularly not at me as happened in March 2011 while I was photographing the protests on Oxford St. But both the manner and extent of the police action seemed completely over the top, though like the rest of the press I was kept well away from the action. There was a small press area along the street east of the building, too far away to get any real view of the action. The public were being allowed roughly the same distance to the west, and from there you could see just a little more. But the picture here was still taken at the long end of the 75-300mm using DX format – a 450mm equivalent lens. Of course there are good reasons why the press – and the public – sometimes have to be kept back from events. Here it seemed to me more about trying to prevent people seeing what was happening than public safety or getting in the way of the police. 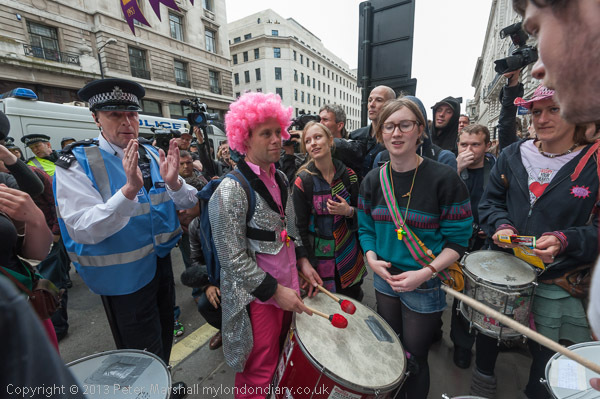 Since it seemed unlikely I had any real chance of seeing anything worth photographing I moved away an joined those who had managed to make it to Piccadilly Circus for the ‘J11 Carnival against Capitalism’. On my way I saw a number of people being searched on the street. One woman had just been put in a police van because a pen had been found in her handbag. As the protesters walked with a samba band down Piccadilly, groups of police rushed into the crowd and grabbed a couple of them. Other protesters tried to grab them back from the police and there were scuffles, and police formed a ring around one of those who had been grabbed. he was on the ground and two officers appeared to be greatly enjoying punching him, but a senior officer pushed me back as I tried to get a clear view and photograph what was happening. I moved a little around the ring and managed to get a picture holding my camera up over the police heads before being pushed back. The police really did not want people to see what was happening. Eventually I went down on my knees and managed to get a picture between the legs of two of the officers before I had to move away. Elsewhere officers were threatening other protesters with arrest, and some of them ran down a side-street. 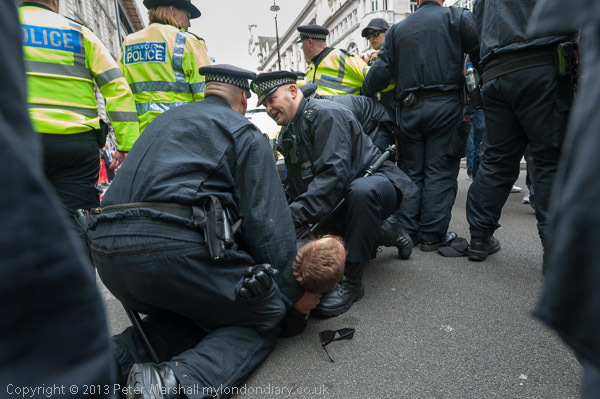 There followed a chase around some of the side-streets of Mayfair, with again police grabbing a protester and making an arrest for no apparent reason. 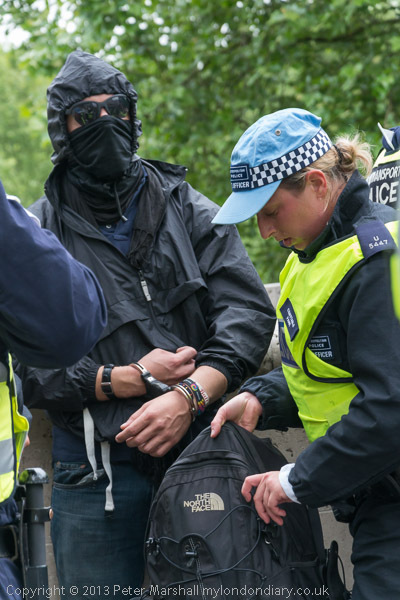 Eventually we emerged by Green Park Station and there were further searches and arrests. Throughout all this (and afterwards) as I report in J11 Carnival against Capitalism, ‘I saw no attacks on property and no unprovoked violence by the protesters.’ There was a great deal of shouting and some name-calling directed against the police, but all of the actual physical scuffles began when police grabbed a protester. Later in the day the police seem to have calmed down a little and perhaps orders had gone out to stop harassing the protesters. They stood and watched and didn’t interfere as the protest continued on Piccadilly, on then Regent St. There was a little moment of farce as a ‘Police Liaison Officer’ came and warned the samba band they were breaking a City of Westminster bye-law by playing music on the street without a licence as they protested outside the offices of arms company Lockheed Martin (above), and a few minute later police seemed close to panic as the protesters approached BP, but really there was not a lot happening. It seemed time to go home, and I did. I’m not a fan of photo-calls, or of the kind of over-organised images that photographers tend to take of them, where someone – a photographer or a PR guy – has carefully arranged a group of scene for a row of photographers who simply snap what has been produced for them. 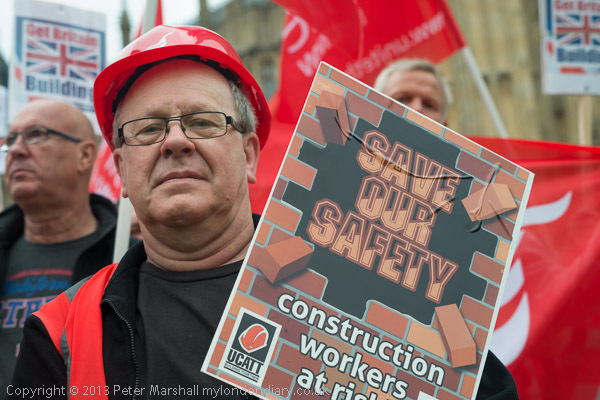 One thing that was different about this one was its subject – against the government dismantling of much of the legislation and inspections that keep most workers safe at work, though even with them in place we still see too many workplace deaths. It is a misnomer to think of these as accidents at work; almost all of them are predictable and preventable if proper safety rules are observed. The second thing was that there was no row of photographers – only three of us had turned up (four including a guy with a video camera), despite the normal press releases to all the media. Deaths at work are generally simply not news, because they happen to ordinary working people and not to celebrities. One of the other photographers was I think working for one of the unions involved, and they probably wanted the kind of group picture that they had set up, although I’m sure that wasn’t all he took. I didn’t really manage to get the kind of pictures that I wanted, though a few (there are more at obby Urges ‘Save Workers Lives’) aren’t too bad. 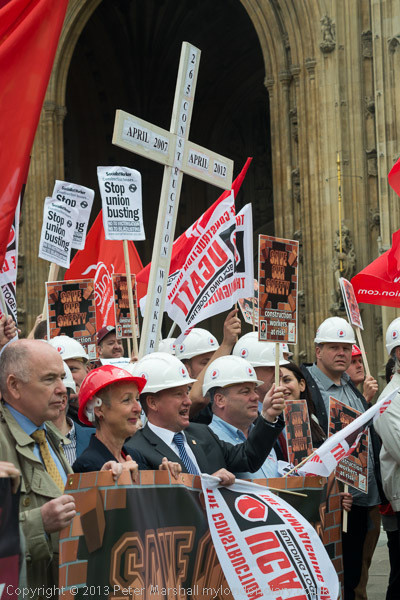 But for me the strongest visual element was the cross, with its message ‘265 Construction Workers’ who were killed at work in the five years between ‘April 2007 and April 2012’, and although I tried a few times (including some not on line) I didn’t really get what I wanted. I wasn’t having a good day, and photographing the London World Naked Bike Ride turned out not to be a very pleasant experience either. Not because of the majority of the riders, but because of the unpleasantness of just of few people concerned. There has always been a small minority of those involved with the event who have had some very odd attitudes to photography – and today I met several of them. I’ve photographed the naked ride through London most years since I first became aware of it in 2006, and still find it a rather curious affair, something between a protest and a bit of fun, attracting some strange characters both among those taking part and those watching. If you decide to take off your clothing and ride a bicycle through the tourist-packed streets of London, you obviously expect people to notice you, to look at you and nowadays when everyone has a camera of sorts that means most of them will photograph you. There wouldn’t be much point in it as a way to protest unless this was the case. So for some people associated with the ride to harass and insult photographers seems rather odd. There seemed to be rather more of this going on at Marble Arch than I’ve experienced in previous years, though I had no problems with the riders I photographed. But even before the event started, I’d photographed one of the event stewards having some kind of fight with a largish group of young people who independently had picked the same location for an Internet meet-up. Then there was a truly weird character walking around with a video camera standing in front of photographers and recording them. With hundreds of people all trying to take pictures it does get difficult to work sensibly. At the start a man standing next to me kept easing his way in front of me and holding his phone camera out in front of my lens, while other people simply squeezed in front holding up their phones. There did seem to be rather more problems this year, perhaps because rather than a single starting point the riders were split between five, and there was less organisation than in previous years. Marble Arch was probably not a great choice, with so many tourists around, and while starting through the centre arch was a nice idea, it wasn’t too practical because it was too narrow and led into an area of heavy traffic. What really should have been a mass start took more like 45 minutes. I took the tube to Westminster to photograph the ride as it came past the Houses of Parliament and Westminster Bridge. The first large group of riders stopped there for a few minutes, mainly I think to take photographs of each other, and seemed happy for me to take some too. At one point I did get a slight shock when I found the Eiffel Tower appearing in the viewfinder. But I blinked and it really was London after all. I wasn’t particularly happy with the pictures I took this year – I think I’ve done rather better in previous years. The protesters had brought with them plants in boxes and fruit and veg to form a ‘garden’, along with a lot of placards and banners, and visually it was rather a mess, as I think this picture shows. 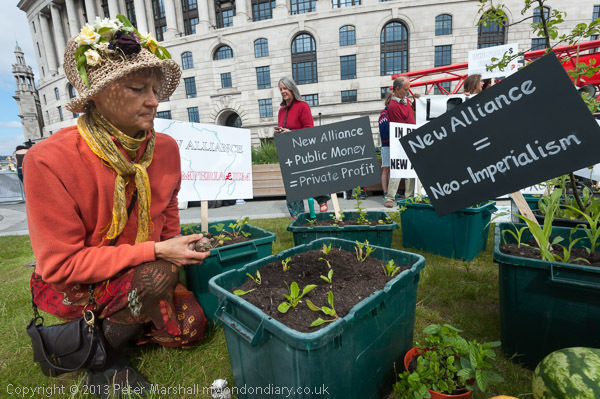 You can see at No to G8 New Alliance on Food Security how I told the story in pictures, and there was one which – at least for me – stood out as a better picture – and you can see it at the top of this post. Of course I didn’t pose it, though the woman I was photographing was clear I was photographing her. Often people do stop and pose, but I tell them to get on with whatever they were doing (I try to avoid saying “act natural”, surely an oxymoron) but after a while people do just ignore you. It would perhaps have made a slightly better picture had she managed to be natural while putting out the plants into the container, rather than just after when she was planting potatoes, but neither she nor I had quite got our act together in time. But there are several things that help it. There are the green plants in the container, put in the foreground to emphasize them. The three placards although all different all clearly tell a similar story about the ‘New Alliance’. Most important of course is the woman at left, and her red jumper and hat with flowers and her yellow scarf are the main visual interest. I wasn’t using flash, which perhaps would have made processing this image a little easier – and it did need some work (which I hadn’t done very carefully in the rush to get this image on-line.) Straw hats are a problem in sun, overlaying the features with a shadow and sun grid which I’ve had to tone down. Often this means zooming into the face and burning down the sunny areas, then lightening up the whole of the face to get more detail in the shadow areas. The groups and charities involved in this protest were critical of some aspects of the other much larger charity event around the same problem, the Big IF, which was taking place in Hyde Park. Since the main part of this appeared to be to construct a large display to be photographed from above and I didn’t have a helicopter handy, I wasn’t particularly keen to photograph this, even though my wife and some friends were taking part. 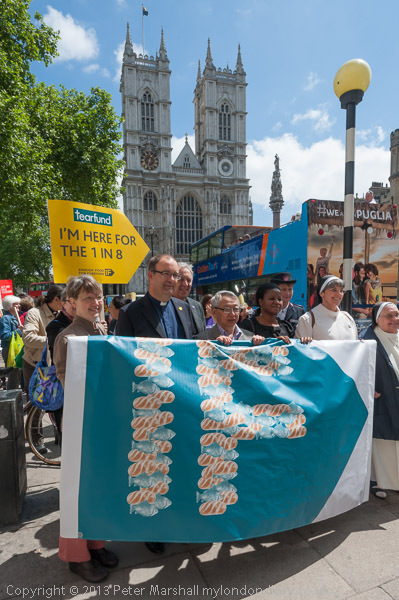 But I’d promised to take a picture of them on the ‘solidarity walk’ from a Big IF church service in Westminster Central Hall to the main rally in Hyde Park. After taking the picture above (or perhaps another like it), one of the other photographers taking pictures at the event, I think for one of the charities involved, came up to me and thanked me because I had alerted him to the rather large building that made a nice background to the image. Well, it was nice to be thanked, rather than just the more normal shoulders that suddenly appear pressing on both sides of me when I’m taking pictures, but it was just a little surprising. It’s something that to me seems so obvious as to be unmissable. It seemed to me a wasted opportunity that this wasn’t a proper march, and any impact that several thousand people walking through London might have had was missed by staggering their starting times, keeping to the pavement and taking a longer than necessary route along the back streets to reach the destination. And I was also a bit annoyed because even though I arrived at the starting point twenty minutes before the advertised time, they had already started on the walk. It really would have been more sensible to hold the service in the open air in Hyde Park before the rally. 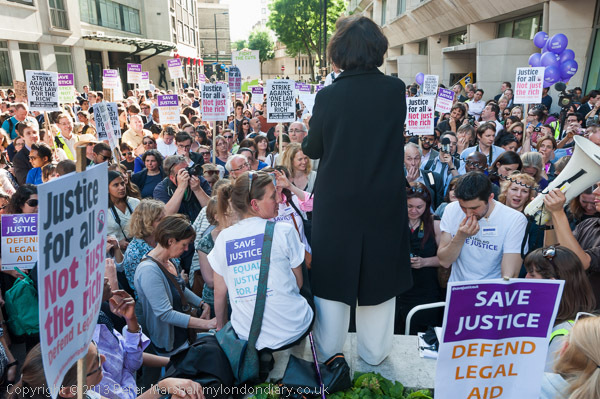 You can see some of the pictures I took on Big IF Solidarity Walk, although not that of my wife and a couple of friends, which is on another web site – it wasn’t a good enough picture for me to want to include it on My London Diary. Some of the people I photograph really are uncooperative! Tories bring back Penal Transportation? Penal transportation to Australia from Great Britain began in 1787, and was used as a punishment for minor offences at a time when you could be hanged for stealing a sheep. It came to an end in the 1860s, but our current Home Secretary Teresa May is reviving the punishment for Trenton Oldfield, born in Australia but who has lived and worked in this country for all his adult life. He could have got away with stealing a sheep, but for a peaceful protest that pointed out the elitist nature of British society, as well as being handed out an over the top sentence of six months (the jury had asked the judge to be lenient, and the probation officer had recommended a non-custodial sentence) he has now been told by the Home Office that his continued presence in Britain would not be “conducive to the public good” and completely ridiculously that he is a threat to national security. The Guardian is running a poll on whether Trenton should be deported. As well as voting in this, you can sign a petition to stop the deportation on This Is Not a Gateway, and another at Change.org. Teresa May perhaps sees the deportation of Oldfield as a way of making up for her continuing failure to deport Abu Hamza. I’m sure she sees Oldfield as an easy target that will get a few cheers from the right wing some of whom who would like to deport or imprison all protesters, wherever they were born. But his and his partner’s work through Myrdle Court Press and This Is Not A Gateway have contributed greatly to cultural life in this country – an important contribution to the ‘public good’, a cultural asset we cannot afford to lose. I hope the campaign to keep Trenton here succeeds, but should he be forced to leave the country, perhaps the deportation of people for peaceful protest is at least one government policy that the Labour party can give a pledge to reverse. It was security guards again the following day, or rather the company that employs many of them – though couldn’t find enough for the Olympics, and don’t provide them for the University of London. 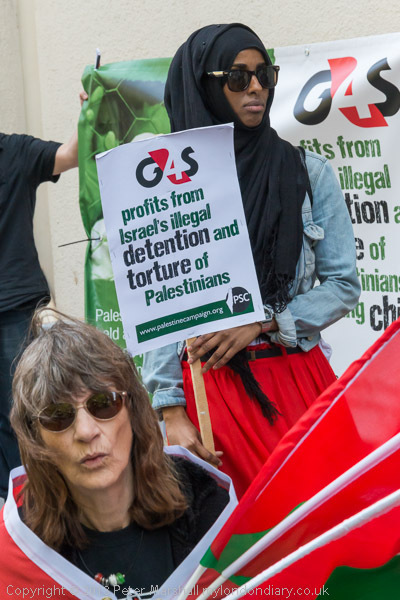 But they do provide security services for the Israeli government to keep Palestinian prisoners in Israeli jails, mainly without charge and in defiance of International law. And they did employ the 4 men in whose hands Jimmy Mubenga was killed on a forced deportation flight from Heathrow. And a few other practices many of us find morally indefensible, as one placard listed. 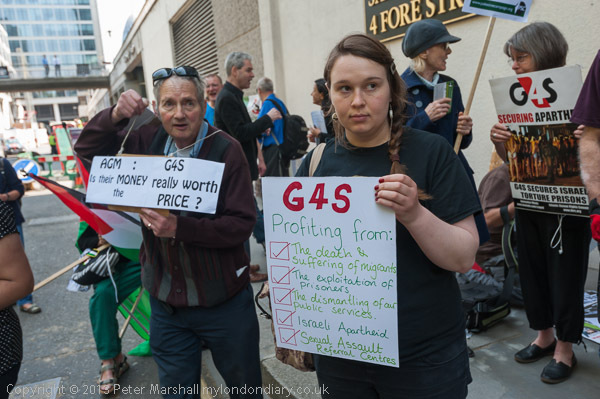 It perhaps isn’t inappropriate that most times I try to type their company name it comes out as G$S rather than G4S. Central London at the moment is full of building sites, and the first three sets of steps I tried to go up to make my way to Salters Hall where their AGM was taking place were all blocked off; eventually I got there by pretending I was a car rather than a pedestrian and walking on a main road past another blockage. The City doesn’t seem to be suffering much from the current recession, despite having caused it. By the time I arrived, with roadworks holding up and diverting my bus, I was a little late and missed the start of the event. 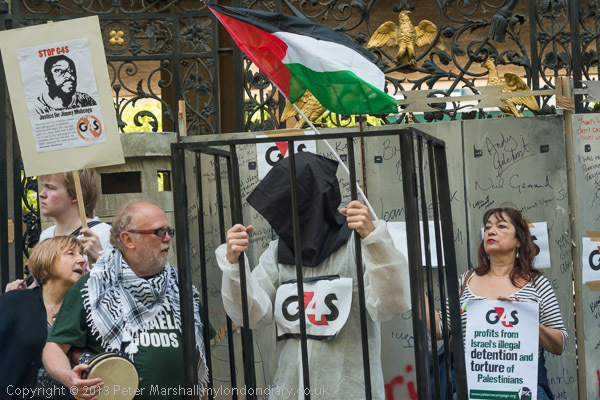 The protest was perhaps just a little confused with several different groups taking part, and the Palestine Solidarity Campaign’s Apartheid Wall and prisoner in a cage were rather tucked away behind the other protesters. It was all a little crowded, with police keeping the protesters off the road, and in this part of the city around the Barbican there isn’t a great deal of pavement, as pedestrians were planned to be segregated from traffic at first floor level on the walkways there – you can just see one of the walkway bridges at top left in top image above. I tried my best to find something but wasn’t too happy with the results. Plenty of pictures that were OK, but somehow I couldn’t fit things quite into place, the magic just wasn’t there. 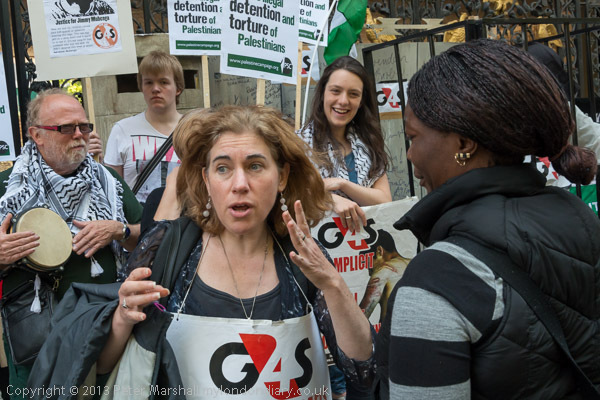 Looking at the pictures at Outrage outside G4S AGM I don’t think it was for want of trying. Some days things just don’t work out as well as others. is truly a key one. The things that she names are truly “placing a stranglehold upon the evolution of the medium“, and that stranglehold is exactly what she goes on to describe as “something magical beginning to happen“. To me the work that she describes lacks real photographic interest, although sometimes it may be mildly amusing. And it is cluttering up galleries that could be exploring the great and still developing wealth of photography. But “the very mechanisms of the medium’s dissemination” have been even more radically changed by the growth of the web. It’s something I deliberately set out to play with in my own primitive way in 2002 when I began ‘My London Diary’ though I make no great claims for the result. Like Cotton I think we have a “beautifully complex medium …” which “has been since its conception, a fabulously broad church” but unlike her I don’t feel its story has already been told. * You might also like to read photographer Thomas Ruff’s Photograms for the New Age in the current Summer 2013 issue. Photographers and security guards don’t always mix well, and I’ve had many run-ins with security in the past. In part the problems have often simply been that the guards have not been properly trained and in particular that they neither know nor understand the laws relating to photography. I spent quite a lot of time in the 1980s in particular educating those guarding sites in London’s Docklands, then an ‘Enterprise Zone’ with huge handouts to the developer friends of the party then in power to build in the area. Although I didn’t always avoid a little trespass – though I never made my own holes in fences, many sites were rather derelict and boundaries rather vague – almost all of the confrontations I had were on the public highway, where I was very sure of my rights. Now its perhaps a little more difficult to always be sure, with large tracts of London now privately owned even when open to the public and looking like public space. I tried always to be reasonable and polite but to insist on my rights. Having told them my rights I usually suggested they either contact their boss or call the police or both. On one or two occasions the police did arrive, and confirmed that I had the right to take photographs, but usually I’d already finished what I wanted to do and moved on before they came. I’d learnt in any case to work fast, and most times by the time the security guard came to tell me I couldn’t take pictures they were already in my camera. More recently there have been many well-publicised examples of photographers getting harassed by security, and I’ve supported the protests of I’m a photographer not a terrorist and am pleased at the work done by members of my union, the NUJ, to educate the police and security guards about the situation. After the incidents shown in the video Stand your Ground made in 2011, some photographers have become involved in the training sessions run by the police for security personnel. With this background, I wasn’t too sure that I wanted to go and photograph a protest on behalf of the security guards employed at the University of London, but soon overcame my prejudices. 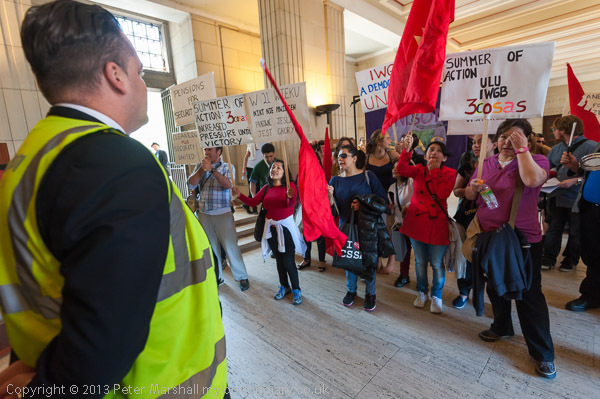 These guys are low paid workers, doing long shifts and getting badly treated, working at the University but being employed by a contractor on considerably poorer conditions than staff who are employed directly by the University at the same sites, just like the cleaners. And theirs is, at least in part, a very useful and necessary job. 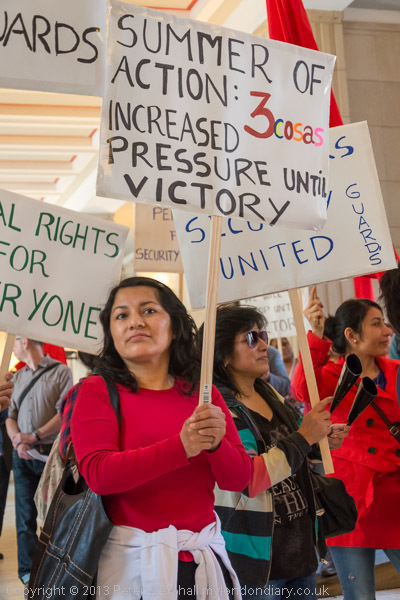 It’s time to get rid of these abuses of low paid workers, with contracting companies being used so that apparently reputable organisations can wash their hands and evade their responsibilities. And as we’ve seen clearly in many areas, contracting out leads to the work being done less well as well as those doing it getting worse conditions and treatment. 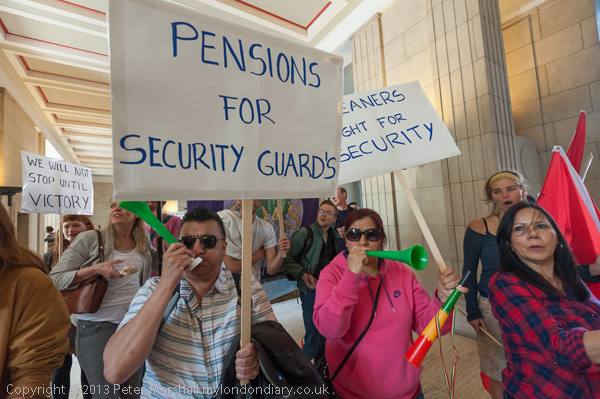 So the IWGB (The Independent Workers Union of Great Britain), a grass roots worker-run union gets my support in its fight for proper sick pay, pensions and holidays for the security guards along with the cleaners and other low-paid workers. The protest got off to a late start (as one of the organisers said, “perhaps we should have said 1.30pm not 1.” Always a bit frustrating, as photographers can’t afford to be late for events, but fortunately I wasn’t in a hurry to go elsewhere. More of a problem was that visually it was very similar to other protests by the IWGB that I’ve photographed before – including one in the same location. And that yet again I’d forgotten my earplugs! 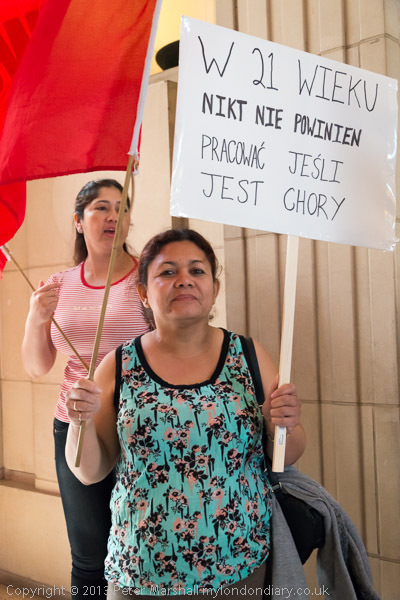 A placard specially for the Polish security guard on duty watching the protest. More pictures at London University Security Guards. A nice little piece in the New Yorker, Montana Ranch, with photographs by one of my favourite photographers, Ami Vitale. It seems a very long time since we met in a castle in Poland. Personally I still sit a little on the fence, and just very occasionally allow myself to have a little prime Scotch beef as a special treat, for example at Christmas – rather than a turkey. I think it is still grass fed like those on the ranches in the pictures. 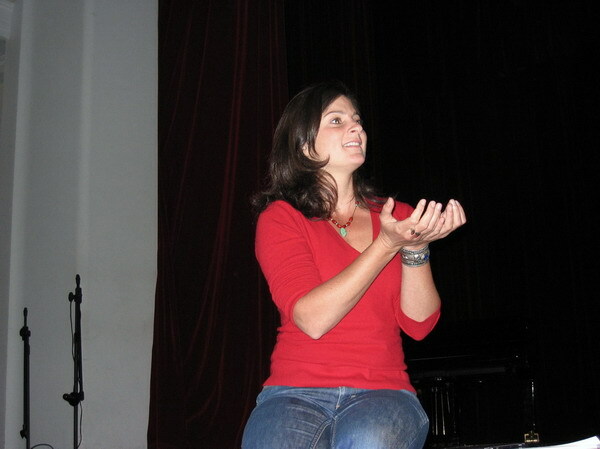 Ami Vitale also makes films, as you can see from her ‘Mamtaz’ Story: The Fight for Climate Justice In the Bay of Bengal‘ on Culture Unplugged, where she is asking for support for her work, which includes a new feature film on the mass migration of people due to climate change called Bangladesh: A Climate Trap. 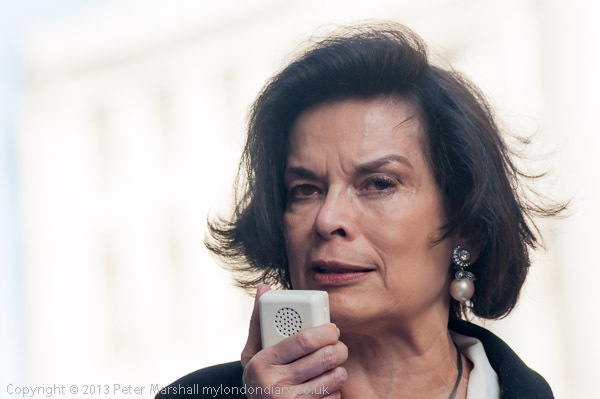 Bianca Jagger was probably the best known of the many speakers at the protest to Save Legal Aid & British Justice, most of whom were lawyers or people from groups supporting those who relied on legal aid, with a few MPs thrown in, including David Lammy, Andy Slaughter and Jeremy Corbyn. It was serious speaker overload so far as I was concerned, not helped by the lack of a written list of them being available. After the first half dozen or so I gave up on trying to write down the names – heard over poor amplification it becomes almost impossible to know what they are or how they might be spelt. I decided I wanted to try something different for Jagger, and thought that she would still be recognisable from behind – as I think she is, thanks to her black and white clothing and hair. I don’t think it is a great picture, but it does give an idea of the crowd, though less than half are actually in the picture. Often advice to photographers on covering events tells them they should start with an ‘overall view.’ It’s something that is seldom really possible, or at least almost never possible to make an interesting image – and there isn’t usually a great deal of point in taking pictures that are so boring they will never be used. But it’s often a good idea to at least try something that gives an impression of the scale of the event. Often this is very difficult from the ground level, and many photographers end up holding the camera as high as they can reach above their heads and pressing the shutter with a hope and a prayer – sometimes called a ‘Hail Mary’ shot. Some use monopods and a remote release (or the self-timer) to gain more height, and I’ve often considered this option, but not yet found one that fits into my bag or I can be bothered to carry. Back in the old days of static press shots, guys carried step ladders, and you still occasionally see these in use, though mainly in places like Downing St pens, rather than on the hoof. There is a place for ‘overall’ images, and if you’ve not seen Lewis Whyld‘s remarkable 360 degree photojournalistic images it’s certainly worth taking a look at these, but for most of us most of the time they are a waste of time – unless we can find a suitable viewpoint. Sometimes a drone with camera attached would be handy! But here I was standing on the wide concrete wall of the same flower bed that was being used as a platform for the speakers (probably built solidly enough to stop tanks attacking the Justice Ministry, and certainly more attractive than the fortifications around Parliament.) Solid and wide enough for my increasing lack of balance and terror of even very low heights that stops me climbing on most street furniture these days not to be a problem. Shortly before taking this image I’d seen Bianca Jagger slip and fall slightly as she was helped up onto the wall. Of course I’d been photographing her at the time, and of course I wouldn’t use those pictures, and I deleted them. But I think she was still looking a little unsettled from her fall when I photographed her speaking a few minutes later. I was also having camera problems, with the D800E taking a few frames and then freezing up with the error message that appeared to read ‘CD.’ In fact it should and probably did say ‘CArd’ but I broke the flimsy covering over the control panel months ago and repaired it temporarily with heavy duty sellotape – still in place but now not very clear and it isn’t easy to read. (I took the camera in for repair shortly after it broke, but my usual repairers told me they hadn’t yet been trained to work on the camera then and it would have to go to Nikon, and somehow I’ve not got around to it since.) The error message seems obvious now, but in the heat of the moment I couldn’t work out that this meant there was a problem with the memory card! Usually I have a 16Gb SDHC card in the camera, format it before starting work and very seldom fill it, but I’d come out in a rush and left that card at home in my card reader. The D800E has I second CF slot, and I’d filled the smaller card I keep there, and had replaced it with another old card from the depths of my bag proved to be incompatible with the camera – though probably it had worked OK with the D200 I’d bought it to use with. But there busy working I didn’t understand what the problem was, but found if I turned the camera off and back on I could take a few more frames, sometimes half a dozen before it locked again, and I kept working like that. There were more speakers after Jagger, but I’d taken enough pictures and heard enough speeches, and decided to walk back to Old Palace Yard to see how the rival protesters for and against gay marriage were getting on. Numbers were fairly even, but the supporters were clearly making rather more noise. 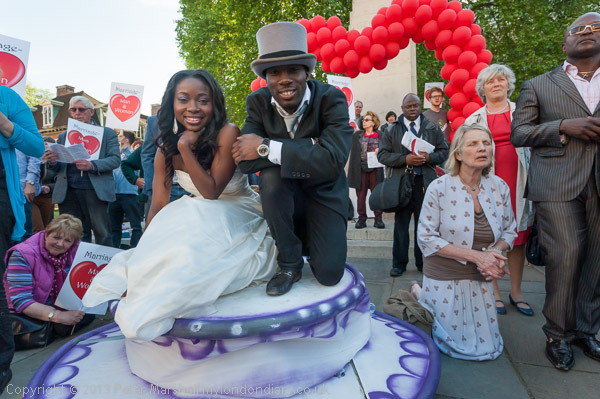 A few from the anti-gay protest stood out, including a posed couple dressed as bride and groom on a ‘wedding cake’, but I found it harder to photograph them those against the bill, not least because of the music. ‘Amazing Grace’ certainly has an amazing history behind it, and is estimated to be performed around 10 million times annually, and it can still be moving, but here I didn’t feel it suited the occasion and the performance grated. As well as these supporters of ‘Christian Concern’ (who certainly don’t speak for all Christians, some of whom welcome the idea of gay couples being able to make the same kind of commitment as heterosexual couples) there were also some more straight-forward old-fashioned fundamentalist bible-bashers wandering around Westminster, preaching to the traffic and carrying a careful selection of poster-print bible quotations. 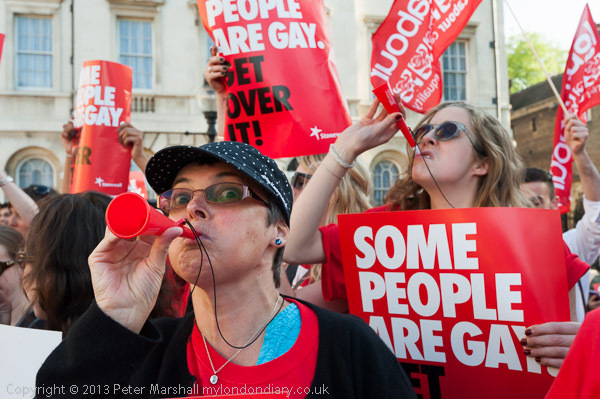 You can see more from these protests For and against Gay Marriage on My London Diary. You are currently browsing the Re-photo blog archives for June, 2013.